Home \ Blog \ heart \ Who would you convince? I have one time served on a jury, which was for a civil case. An introvert who has interest in people, I usually pay attention to council communication style before I size up the evidence. Those who work with me, who help me feel comfortable and clear with the information are who I will most readily be influenced by. Those who don’t care about me or don’t care that I understand their logic have just shot themselves in the foot. And I am not alone here. I recall swaying two thirds of a jury to come full circle the other way. It took only 2 others to support my ideas before it happened. Of late I have observed two attorney presentation styles while watching a case presented in Common Pleas Court. The prosecuting attorney, in my best language, is detestable. His arrogant, looking-down-his-nose-on-others disposition created disrespect in almost vulgar ways. When speaking, this tall, thin, well-couffed individual belied his appearance, while making sparse eye contact and resounding throughout the courtroom. He wanted all present to know his voice could bounce off walls, jarring his well-thought phrases into our minds. His movements were measured, deliberate and planned. His focus, quite frankly, was on himself. On the other hand, the unkempt, disheveled defense attorney, pathetically out-performed 3-1 in team members present and struggling with vocal support was quite the underdog. His ammunition was sparse up against the army of prosecution soldiers. He often displayed exasperation, which almost lost him the jurists’ attention. But his heart was in the case. Evident through his argument in defense of his client as well as with the witnesses he brought to the stand, the defense attorney, despite his many presentational flaws, had my vote. 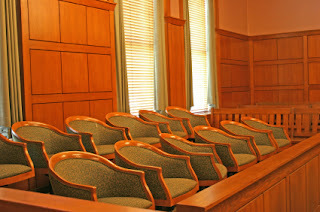 Although I am not serving on the jury, I watched individual jurists closely from the public pews and determined several to have my communication style – the most qualified to be positioned as the turning point catalyst in debate. Passive aggressives may not be the first out of the box with their opinion and ideas. But they will be the most influential based on their poise, their strength of engagement and their persistence. Several of these jurists were taking notes, studying the communicators, squinting to shield themselves or getting caught up in the emotion while covering their mouths. I saw five who would sway the argument in the jury deliberation room. To what degree would they succeed? Only time will tell, for the case is now in their hands. Did the prosecution even notice? No. They seldom paid attention to the jury – only the weaknesses of the defense. Or themselves. Was this noticed by the jury? Perhaps. I noticed it. Chances are pretty good those like me did as well. Will they speak up? If they have strength of character they will. I hope they do. Attorneys with heart may not be as revered in law circles as those with intelligence. Yet the jury connects with emotional intelligence. The jury is made up of everyday folks who don’t understand legaleze, who prefer to have respect and who want to do the right thing, having a heart for the underdog. Attorneys, who would you convince by your presentational style?